Educational outreach to residents of the watershed is a major goal for the FROG Project. The communities of Elgin and Sonoita are located on the upper watershed of Cienega Creek. Their activities have direct and indirect impacts to the water table and to the plants and animals living in the creek. Many of the High School students from the area attend school in the Vail School District. Since the start of this project we have worked with teachers and students from Empire and Cienega High Schools, leading field trips and developing activities to teach about the flora and fauna of Cienega Creek and the threats to this fragile ecosystem. At Cienega High, we helped the students design a habitat on the campus. We led field trip to Cienega Creek so the students could identify habitat needs for fish and frogs. With help from US fish and Wildlife Services Partners Program and the Arizona Game and Fish Department, the habitat at Empire High is now home to three aquatic species from Cienega Creek, the endangered Gila topminnow, longfin dace, and the lowland leopard frog. At Empire, we worked closely with the environmental science class to design a protocol for monitoring aquatic habitats being developed by the FROG Project to reestablish native fish and frogs to Las Cienegas National Conservation Area. The class will become the stewards of several man made habitats. In 2010 and 2011 the class helped build a large pond now stocked with 3 endangered species, Gila topminnow, desert pupfish, and Chiricahua leopard frogs. Several times a year the students will visit these sites and monitor the health of the habitats, identifying potential problems and solutions, recording water quality and documenting the species observed. Students will also develop and implement their own outreach to the local community reaching far beyond the FROG teams ability. Cienega Highs' environmental science class at the newly renovated Road Canyon Tank. The students helped rebuild this pond and installed a liner to conserve water. The site is now habitat for native fish and frogs as well as an important wildlife water on Las Cienegas National Conservation Area. The YES! program is in its first year. Started by the Cienega Watershed Partnership and other YES Network partners, our first pilot program is being funded by the partners with support by the Arizona Game & Fish Heritage Fund. On the Las Cienegas National Conservation Area, managed by the Bureau of Land Management (BLM), 7 students ranging from 14 to 18 are assessing locations and managing an ecological improvement site. Through a series of field days, the youth and their mentors from CWP, BLM, the Prescott College Ironwood Learning Experience, Empire High School and supporting organizations are orienting these students in grassland ecology, site assessment skills, cultural resource values, and the restoration of plants, prairie dogs and Chiracauhua Leopard Frogs so that they can engage in managing a specific location. The Youth Group selects a site for further management and restoration work, develops its leadership and technical skills, learns to apply environmental and public land laws, does hands-on restoration, and manages its own small program budget. We've performed presentation to area Rotary Clubs and community forums and tabled displays at community events. Wesupport local businesses and contractors incorporating them into various aspects of our projects. We work closely with key ranches bordering Las Cienegas National Conservation Area to survey the aquatic habitat on their ranch lands, remove invasive species and develop habitat for native species. Empire High School students building a waterfall into the campus fish and frog habitat. sign of new habitats being built by the FROG Project. The students chose to steward Cottonwood Tank, a FROG Project aquatic species recovery site. They prioritized a list of projects to help enhance this habitat for leopard frogs and native fish. Students identified fencing as a top priority. They mapped and marked fence lines for a wildlife friendly fence to keep livestock out of the new habitat. Other projects included mapping a project area around the habitat, buying 5 tons of rock to help stabilize the storage tank erosion and enhance shore line habitat and to work with the FROG Project to develop an interpretive sign for the site. FROG Team meeting with the High Haven Ranch were the Barchas family volunteered their ranch to steward a leopard frog habitat as part of a US Fish & Wildlife Service Partners Project. 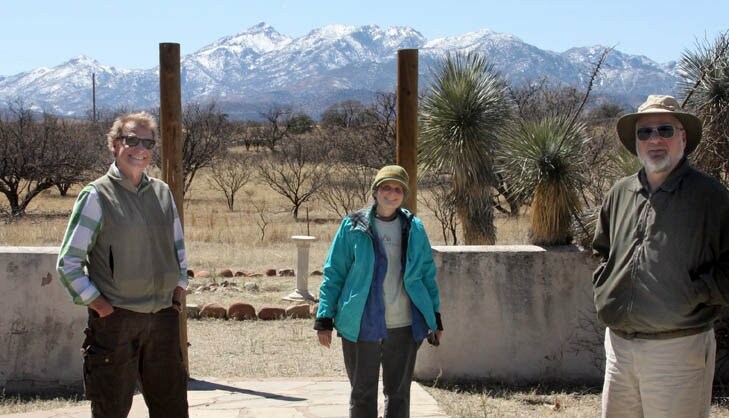 The ranch is superbly located in a dispersal corridor between the Santa Rita Mountain frogs and the Las Cienegas populations of leopard frogs.